A special tin for baby's money featuring Rufus Rabbit. 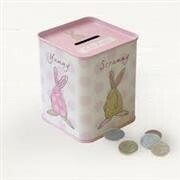 This measures 7.5 x 9.5 cm and will hold up to £200 in £2 coins. Pink or Blue.